Polish rabbi of the seventeenth century; author of "Be'er Heṭeb," a commentary on Shulḥan 'Aruk, Oraḥ Ḥayyim, based upon the later casuists (Amsterdam, 1708). In the preface Isaiah asserts that he wrote a similar commentary to Shulḥan 'Aruk, Yoreh De'ah. Steinschneider ("Cat. Bodl." col. 1384) and Fürst ("Bibl. Jud." ii. 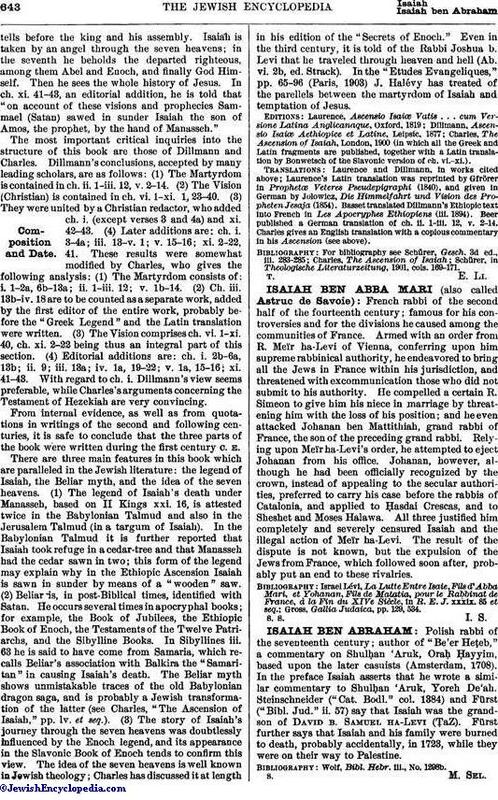 57) say that Isaiah was the grandson of David b. Samuel ha-Levi (ṬaZ). Fürst further says that Isaiah and his family were burned to death, probably accidentally, in 1723, while they were on their way to Palestine. Wolf, Bibl. Hebr. iii., No. 1298b.